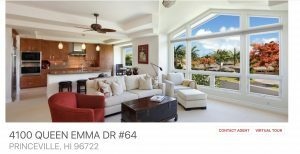 Ka’iulani of Princeville is a newer award-winning, low-density, luxury residential community consisting of spacious attached homes. The basic design concept includes upscale design, finishes, and amenities for full time and second-home buyers with “above-the-ordinary” requirements. Detail to quality and extraordinary service with an on-site manager and concierge services. Lighted walking paths, 3 heated pools, 2 outdoor kitchens are a few of the gathering places homeowners enjoy at the prestigious Kaiulani of Princeville. Unit 64 has many special design features & upgrades: a full house water filtration system additional under counter water filters located in kitchen & dual master sinks upstairs Sub-Zero and Wolf built-in stainless-steel appliances: refrigerator, electric wall oven, electric cook top, microwave oven Fisher Paykell dishwasher MayTag Neptune Super Stack Washer/dryer & laundry sink Custom Aristocratic cabinets with slab granite countertops throughout Kohler and Grohe plumbing Assisted cooling (AC) Hand carved wooden leaf fans Custom wood railings Invisible screen door on back lanai and screen door on front door Plantation Shutters in both master bedrooms and Hunter Douglas Honey-coned blinds in living room & kitchen Fully furnished Entertainment system & wall mounted Sony TV and speakers 10 ft and sculptured vaulted ceilings with wall to floor windows that capture the east and north shore mountain ranges plus mesmerizing sunrises.